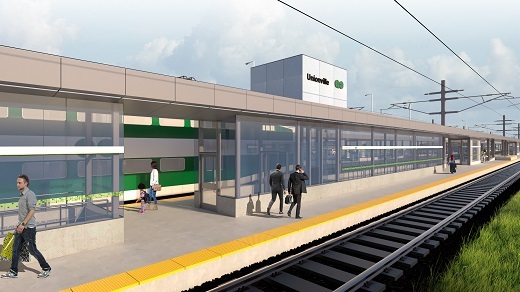 Major improvements are underway at Unionville GO Station. We're updating amenities, adding more parking, enhancing accessibility and, making it easier and more convenient to access GO services. New track and platform: Our contractor is starting to clear land on the west side of the tracks. Soon after, they will start installing support beams for your new second track and second platform. 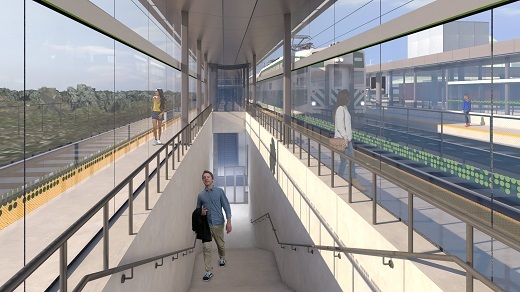 Adding a second track and platform will mean that in the future you will be able to access trains travelling in both directions throughout the day. Construction crews will enter the site from a temporary road off Enterprise Blvd. Please be mindful of large construction vehicles entering/exiting from this new roadway. New parking lot: Work is progressing well on your new parking lot. As a reminder, please do not park along the GO access road. Larger construction vehicles will soon be on-site and vehicles parked along this road are at high risk of being damaged. Click on our travel guide to learn more about carpooling, getting dropped off, taking public transit or walking to the station during construction. We are working on building you a new parking lot to give you access to more parking spaces. We've also started preliminary work to build you a second track and platform. We will let you know of any upcoming changes. We’re building new station features to accommodate the additional 1,000 daily customers we anticipate in the next 10 years and to prepare for future two-way, all-day service. improved signage, lighting and landscaping. These improvements will help support future 15-minute, two-way all day service between Unionville and Union Station. Learn about more service and improvements planned for your corridor at Metrolinx.com/Stouffville. Sign up for our email and text alerts, to stay in the know about the construction that will transform your station! We will do our best to minimize the impact to you. Since construction can be disruptive, we will use the On the GO alerts to flag any changes to the way you get in and around your station. Updated March 25, 2019 | All renderings are subject to change.